What is the difference? Which is the best? Which should you buy? Paddleboarding is the latest craze to hit British waters. The original bulky, rigid boards are still widely used, but inflatable paddleboards are now leading the trend - they're much easier to transport, simple to set up, less expensive and are making this fun beach hobby accessible to all. 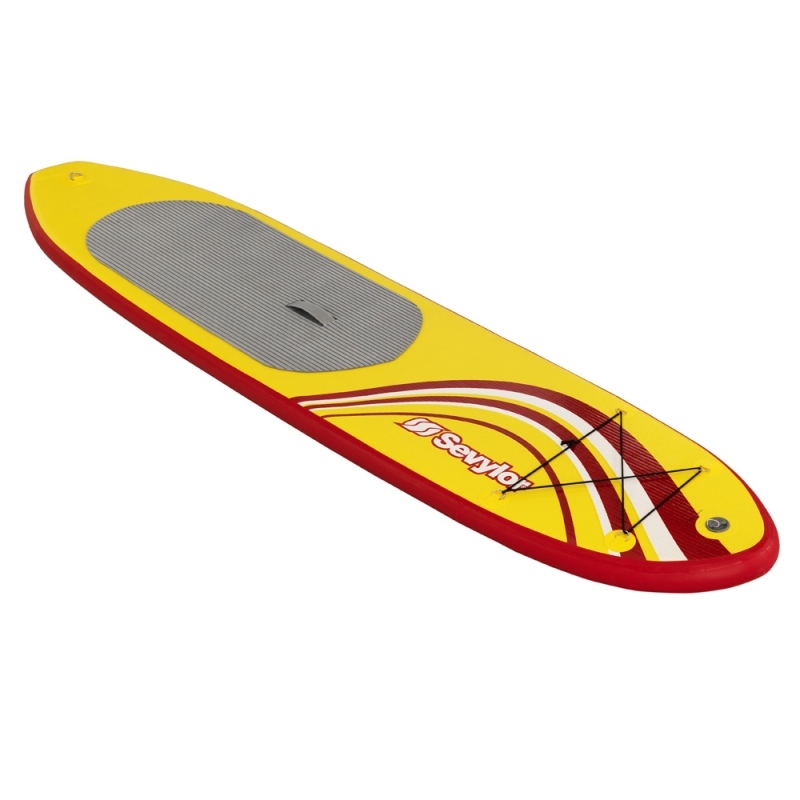 When choosing a paddleboard, it's easy to get confused by the range available. 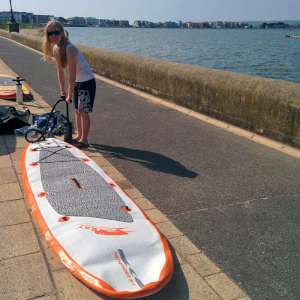 I headed down to Poole Harbour to test and compare two great inflatable paddleboards sold by OutdoorGear - the Pathfinder S-I300 Inflatable Stand Up Paddleboard and the Sevylor Inflatable Stand Up Paddleboard. The Pathfinder and Sevylor are both inflatable paddleboards and each pack down easily into a large bag. This means they're both great for transporting in a car boot or on your back, which is impossible for any comparative rigid board. 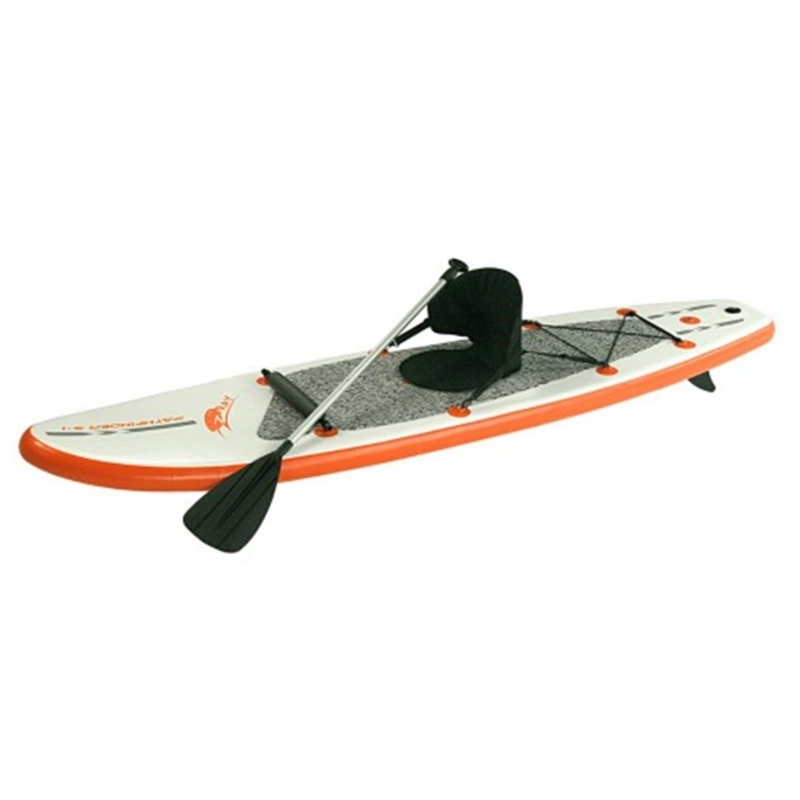 When looking at the price tags, the Pathfinder has an RRP of £599, with the Sevylor more expensive at £699.99 (see OutdoorGear's current SUP prices). Included with the Pathfinder, you get a removable seat and footrest, heavy duty paddle, single action pump, valve wrench, extra removable fin (with 2 fixed) and a carry bag. The Sevylor comes with 3 removable fins, double action pump and carry bag. On the outset, I far preferred the Sevylor's superior double action pump (inflates when you pump up as well as down). The Pathfinder was initially slower to inflate but, towards the end when pumping up to the high pressure required became difficult, I found the single action pump easier to use. I should note that, as a slight woman (5ft and 47kg), I struggled to pump both of the paddle boards up to sufficient pressure and had to get help from someone stronger. It seems that Pathfinder have made the 2 fins fixed to save time and energy for the user but actually, you have to be careful that they don't get distorted while the board is stored (and affect your steering on the water). The detachable fin can be attached once the board is inflated, but requires a screwdriver (not included). I made do without the screwdriver for this test, as I knew I wouldn't be going too far and the fin remained secured for the duration. 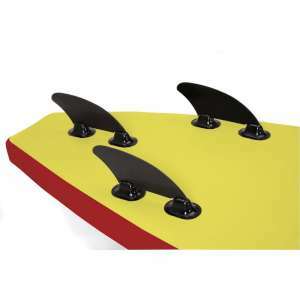 Sevylor's three detachable fins are good and do not require a screwdriver, but make sure that you attach them before you inflate the board! These would be good if you want to sit on the paddle board for any length of time in comfort and certainly make it versatile. However, I didn't feel the need to make use of these extras. I would say that they're nice to have, but if you want to sit down for a journey, opt for a kayak which is designed for that purpose. I can see the seat and footrest being packed in a cupboard and rarely used. The extendable paddle that comes with the Pathfinder did the job very well. I had no problems with using it and it conveniently shortens and fits in the same bag as the board. 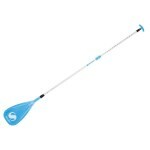 The Sevylor does not come with a paddle and I used the Sevylor Stand Up Paddleboard Paddle, sold separately. 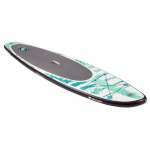 This was very similar to the Pathfinder paddle but was lighter weight. Again, this paddle is telescopic and fitted easily with the Sevylor board in the bag provided. Both paddleboards tested came with a carry bag with shoulder straps (to be carried like a rucksack). Pathfinder's was a simple black bag with a single drawstring top opening. It certainly had plenty of space for the board, pump and extras but was far outshone by the bag that came with the Sevylor board. This bag seems more hardwearing and had a full zipped front panel so that it's really easy to take out/replace the board, with a buckle clip to keep the board secure. It was also much more comfortable to carry when full than Pathfinder's. The Sevylor was marginally quicker to set up than the Pathfinder because of its superior, double action pump. But each board was unpacked, inflated and set up in fewer than 10mins. Both boards needed to be pumped up a little more than I expected, have a look at the user manual and take note of the recommended pressure to pump to. The deck of the Sevylor has slightly better grip and feels sturdier. Both boards performed well but if I had to choose between them, I would opt for the Sevylor. 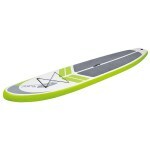 I have previously used a rigid paddleboard and this was my first time trying an inflatable version. Although slightly less stable on the water, I would definitely choose to buy an inflatable board over a rigid board, simply because they are far more usable. Both inflatable boards can be easy packed away, stored and transported without the hassle of roof racks or a van. 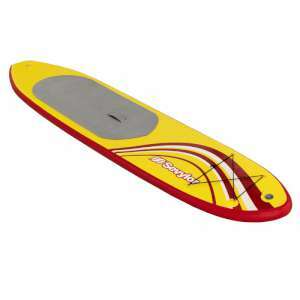 The usability of the inflatable boards far outweighs that they are slightly less stable on the water than rigid boards. 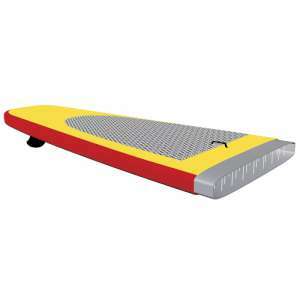 Inflatable boards are also less expensive. Of the two boards tested (and price was ignored), I would recommend the Sevylor over the Pathfinder. The Sevylor is just as easy to set up with better accessories (fins, pump and bag) and is more stable on the water. 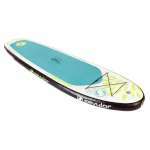 However, if you want a great value paddleboard and want to spend less, the Pathfinder is certainly a great option, the quality of the board itself cannot be faulted, it is only its accessories when compared to the Sevylor that let it down slightly. Either way, you'll get out on the water and have hours of fun this summer.